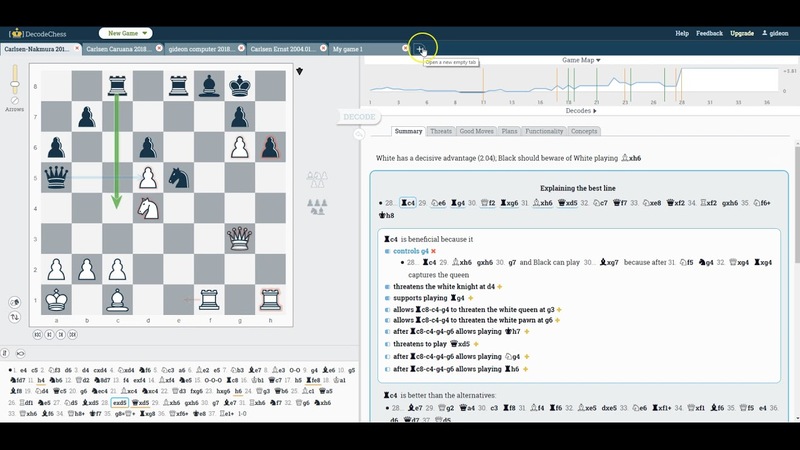 DecodeChess is an ambitious project which automatically supplies chess explanations like a human. This is a huge task which already surpasses what was achieved before. It is also a dynamic project which keeps changing and evolving with new ideas constantly assimilated into it. The current version has made a major step forward in achieving both a more intelligent understanding of the position with a compact and easy to use display. Explanation of the advantages and disadvantages of the best continuation. This is really cool: while you follow the computer recommended moves a detailed explanation of the move is being supplied. Improved the accuracy of the description of the move functionalities. In the main explanation area on the right of the screen, we have added important details to the short summary, such as a significant threat that the player should take care of as well as the ‘Weaknesses’ to assist you in understanding the game better. The ‘Good Moves’ tab now shows the best continuation for each good move. New arrows have been added to the board to show the intentions and threats of both players. They are shown along the best continuation and along the solution variants in the Attacks tab.